There is steadily increasing interest in unmanned high altitude aircraft and airships for a variety of applications, including providing internet and communications access to underserved geographies and monitoring weather systems. Targeted mission durations are long: 6 to 12 months. 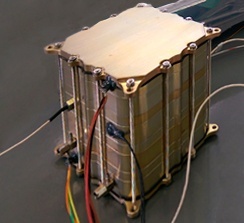 The challenge is to provide a reliable, low cost and durable power system. Giner has unique experience in the design and provision of regenerative fuel cells for this application. Regenerative Fuel Cells combine an electrolyzer that converts solar energy into stored chemical energy (pressurized hydrogen (H2) and oxygen (O2) gas), with a fuel cell that can convert the chemical energy back to electric power and water. Doing so completely closes the system (no fluids are lost), and a regenerative fuel cell (RFC) results. Low-mass, high-energy RFCs offer significant advantages over batteries, as RFCs; have the ability to repeatedly undergo near 100% charge and discharge cycles. In order to store the gaseous fluids in reasonable volumes with minimal mass, the electrolyzer portion of the system typically operates at significant pressures. As the acknowledged leader in high pressure electrolyzer technology, Giner has worked with private and public sector organizations to design, fabricate, and operate lightweight, high-pressure electrolyzers capable of producing high purity gas streams at pressures of 0 to 80 bar. We are currently developing designs for 140 bar operation for NASA’s Mars/Lunar exploration programs. Key in all our designs is world-class efficiency at high current density to electrolyze the most water possible, with the least electrical energy and the lowest total system mass.